Imagine, if you will, the earth as a human body, and all the water in rivers, lakes and oceans as that body’s blood supply, filling the lungs (i.e., the atmosphere) with oxygen and taking wastes away via delivery to the kidneys, liver and intestines (and perhaps even to the appendix and/or tonsils, though doctors are still debating that). If you mess up your blood supply with excesses of one kind or another – salt or fat or sugar – or you take recreational drugs (or large amounts of doctor-recommended drugs that don’t agree with you), you may find yourself feeling ill. The feeling may be as mild as a momentary attack of nausea, or as strong as an allergic reaction which doctors call anaphylactic shock. This is a deadly clash between your immune system and something you’ve ingested, but the reaction is all out of proportion to the item ingested. Regardless, you must be treated quickly to prevent death. Most of us get past this temporary toxicity by drinking lots of water, resting, even taking compounds like vitamins or herbal mixes guaranteed to undo the damage. And most of us survive, a little worse for wear but smart enough not to do the same thing again. But what if our chemical poisoning (or whatever you choose to call it) was something other people did to us? What if we weren’t allowed to say no? That’s how the Earth must feel in this century, dulled and sickened by all the stuff humans are putting into Her bloodstream. This anthropomorphic Earth, which James Lovelock calls Gaia, is a living entity just as we are. Lovelock is an imaginative author and atmospheric chemist with degrees in chemistry (B.Sc. ), medicine (Ph.D.) and Biophysics (D. Sc.). The Gaia concept is, for lack of a better analogy, his metaphor for Earth as a self-regulating system whose various organisms and functions help modulate the “terrestrial and atmospheric” conditions that make the planet livable. Working with microbiologist Lynn Margulis, who died in November of 2011, Lovelock came to the conclusion that plankton acted as a living thermostat, with bogs or peat deposits – also known as permafrost soils or tundra – regulating glaciation by either releasing or sequestering the greenhouse gases that contribute to global warming. For millions of years, Earth has maintained her balance, allowing some species of animals to thrive while others perished. More recently, as humans fill the atmosphere with carbon dioxide, Earth has lost that balance. It would be a good time for all of us to step back and consider our actions. Our oceans are filled with plastic bags and plastic bottles, all leaching various amounts of toxic chemicals like PCBs and PBDEs, which affect not only marine mammals but humans, damaging immune systems, imitating estrogen (which affects male and female health), and even causing cancer. 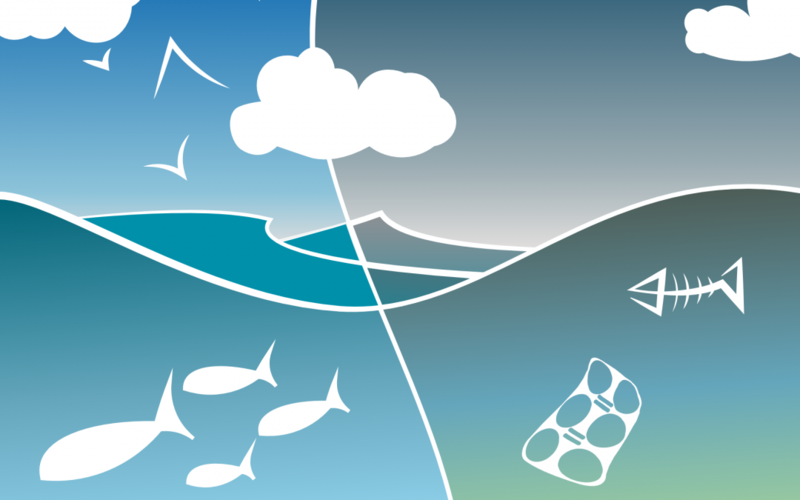 Many people have already heard of the Great Pacific Garbage Patch, an ocean gyre or whirlpool which drags in waste from our profligate, plastic civilization. The Patch is not the size of Texas, however, because its distribution is so irregular that no one can calculate how big it is. It might be the size of Rhode Island, or even the continental United States. The Patch is also not the only plastic-ridden ocean gyre. There are four others (the North Atlantic, the South Atlantic, the South Pacific and the Indian Ocean), all created by massive ocean currents that meet, take a moment to swirl and dance, and then go on their way. All contain greater or lesser amounts of primarily plastic, which – due to photodegradation or exposure to sunlight – ultimately turns into small bits and pieces that marine creatures ingest thinking it is food. 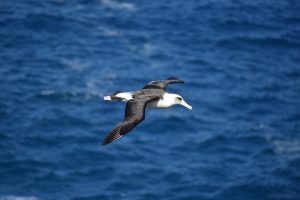 These plastics, from the bisphenol A (BPA) in bottles to the “nurdles” (pellets) used in plastic manufacture, is responsible for 40 percent of the immature albatross population on Midway Atoll dying from malnutrition and dehydration. When examined for cause of death, researchers noted that at least half the contents of the chicks’ stomachs contained throwaways like plastic combs, food wrappers, the pellets from papasan chairs, the stringy stuff from body scrubbers, and even molded toys like army men and Barbie knockoffs – all of which albatross mothers had fed their young in the mistaken impression that it was food. The same is true of other ocean-going species all up and down the line, from whales, dolphins, seals and turtles unable to breathe because of plastic blocking the esophagus and bronchial tubes, to fish unable to expel water from their gills because of plastic film. This is to say nothing about the former six-pack plastic can rings that had for years been strangling or killing marine creatures until some manufacturers uniformly banned it. Unfortunately, not all domestic bottlers have been so enlightened, and can rings continue to mangle and murder. In addition, the plastics – especially those from bottles – are endocrine disruptors. We are not able to monitor marine species thoroughly enough to determine exactly how their bodies respond to plastic, but we do know that we humans are now starting to eat the fish and other species which ate the plastic, resulting in profound and perhaps irreversible damage to developmental, neurological, immune and reproductive systems. This, besides evincing perfectly circuitous karma, suggests to some of us that there is no “away”. And that is the greatest Gaia lesson of all; that there is also no “them and us”, but only living beings dominated by species at the top of the food chain like humans, who have done little to earn their exalted reputation. Endocrine disruptors like dioxins, PCBs, DDT, and various pesticides accumulate in fatty tissue, introducing reproductive difficulties at all levels of the food chain but most notable among humans. There, the two most disturbing effects are girls under the age of 10 reaching menarche, and undescended testicles in young boys which have provoked rumors of boys turning into girls and other transgender issues. We can’t take back the plastic we have already made, but unless we want P.D. James The Children of Men to become a prophecy instead of just a really good book (and movie), we can either stop using it or start manufacturing a truly biodegradable version from soybeans or corn that might, in fact, prove to be pretty good food as well. In any case, it’s certain to be better than fast food!